Yes, you'd never believe it! Lentils are incredible. Not just in exotic ethnic cuisines, not just pulverized in lentil soup. But good old genuine lentils. They come in many varieties -- green, black, red, even beluga (the tiny super black ones) -- large and small and from different origins. But they all have a few important items in common: lots of fiber, lots of protein and very little fat. An amalgamation of some of the best nutritional aspects a food can hope to have. These are some of the best calories you could possibly consume. Eating a medium sized portion of cooked lentils is the equivalent nutritionally of eating the leanest possible piece of meat without any cholesterol and the most high fiber serving of whole grains with no fat. And it's a legume! A pretty darn cheap one at that! Yes, with 8-12 grams of fiber (32-48%DV) per quarter cup and 9-13 grams of protein (18-26%DV) and no grams of fat, it is my own personal super food, my Frankenfood, the best 120 calories you'll ever eat. So you're probably wondering what to do with this freakish combination of nutrition (a la Frankenstein). How about a simple, elegant and beautifully tasty Mediterranean lentil salad? 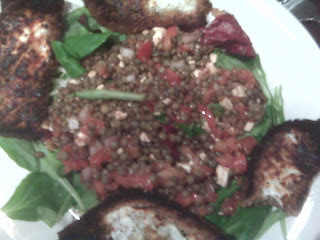 You can use any size or color lentil here, but I think the smaller and darker the better for this salad (like the beluga or black varieties). Simply follow the package's directions for preparing the lentils. Usually it involves bringing lentils up to a boil in a pan with a little salt and then letting them simmer for another 15-20 minutes. It basically hydrates and heats them. Once done I would drain the lentils and transfer them to a large bowl. It doesn't matter how much you make, since it is salad and is even great cold as leftovers. While your lentils are cooking, it us a good idea to finely chop at least one tomato and half of a red onion per half cup of dry lentils. You might also want a few sprigs of cilantro or basil chopped as well, depending on your tastes. Then, also chop up a hunk of feta cheese, maybe two to three ounces, or use already crumbled feta. It is also good to make a balsamic vinaigrette now too. Mix one part good balsamic vinegar (the thicker the better) with two parts extra virgin olive oil. Whisk it hard while drizzling in the olive oil. Allow it to thicken somewhat and add some salt and pepper. Once the lentils are in the bowl, add the onions, tomatoes, herbs and cheese. Mix them together and then add the vinaigrette over the top, mixing again. You can add more pepper and a little more salt to taste. Serve over dark greens like arugula or mache. It is really delicate and delicious either warm or cold, and is just a smooth, comfortable and quite easy meal. No grains are really needed; no meat is needed. All because of our tiny, little amalgamated legume star.